Believe it or not these six riders made up less than a quarter of the class they competed in. From left to right are Stacy Klein, Emily Mallory, Shirley Murphy, Tim Malone, Tracey Lightner and Kristi Jacobson, each of whom made the top six in the 2'6" fences class at the Alumni Tournament of Champions on May 18th. 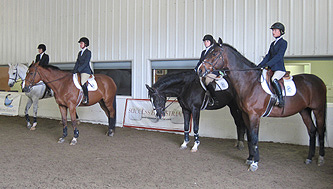 Malone, a 2007 Dartmouth College graduate, won the division while Murphy, who founded the University of Massachusetts at Darmouth team as an undergraduate, was reserve champion. 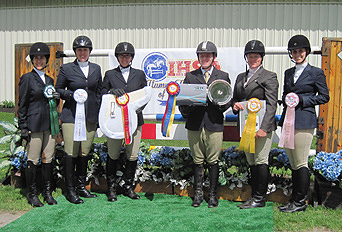 Long Valley, NJ - Riders from 11 different IHSA regions took part in the third annual Alumni Tournament of Champions on May 18th at the Centenary College Equestrian Center, with riders from three different regions claiming a blue ribbon over the course of five classes. Though this is not officially an IHSA event all riders entered must have shown IHSA at least once during the regular season to be eligible to compete in the Alumni Tournament. The IHSA rule book also has something to do with one of the divisions. The rule book states that alumni riders who show in alumni fences must be able to jump at least two feet three inches (or the height of the novice fences) in order to enter. Some regions therefore set their fences at the novice height throughout the season. However some regions have a great deal of alumni who showed intermediate or open and feel more comfortable jumping fences set to the intermediate level (two feet six inches). As a result there are separate alumni over fences classes for those jumping 2'3" and those clearing 2'6". The first class of the day was the 2'3" fences. After all seven riders had gone four were invited back to test. After the testing the winner turned out to be former University of Scranton rider Michelle Geise. Geise is unoffically known as the official Zone 3, Region 4 photographer, and today took many photos save for a few she herself was in (including this first class of the day). Geise is one of a small number of riders to have competed in each of the first three Alumni Tournament events. The runner-up in the 2'3" fences was Meaghan Hennessy of Post University, who was the only rider from all of Zone 2 entered. Seeing as riders from schools in the state of Connecticut won both of the Alumni Cup awards the first two seasons - and that Hennessy was not entered in the cup class - the award would go to someone who went to school someplace other than the Constitution or Nutmeg state in '14. It was called 'Flat Advanced' on one page of the program and advanced flat on another. In any event 2013 High Point University graduate Julianne Kime won the division that was the more difficult of two alumni flat divisions at the tournament. 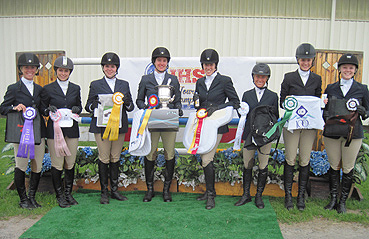 From left to right are Malone, Rachael Lallier, Kime, Sara Palmer (a former University of Delaware rider who was reserve champion), Ashton Phillips and Eryn Ziegler. The 2'6" alumni fences class followed, with a remarkable 25 riders entered. 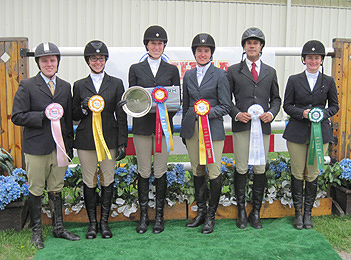 No less than 14 of these riders competed in at least one of the open divisions as undergraduates. Though there were more riders entered in this division than any other Judge Mary Babick called back only four to test. When the class was pinned only one of the six riders to receive a ribbon could claim to have graduated in the current decade (former Lebanon Valley College rider Kristi Jacobson had this destinction). Otherwise two riders graduated in the '00's while three received degrees in the 1990's. Tim Malone, who graduated from Dartmouth College in 2007 won the class while Shirley Murphy, who started out at Boston University in 1986 but graduated from the University of Massachusetts at Dartmouth (where she started the team in 1989) was reserve champion. Next up was the Alumni Cup over fences phase, with 17 riders entered. Just as at IHSA Nationals a score was given for each rider after they jumped. Westminster College graduate Aidan Mewha easily had the top score with an '85' while Katie LaDow of the University of Delaware was in second with a '78.' No awards were presented as each of the 17 entries would be returning for the flat phase. After a near one hour break during which Horse Quencher did a similar presentation to one at the previous alumni tournament, the first of the flat heats took place. Flat advanced group A was the first to go, with a group of seven to be followed by a group of nine for the first half of the traditional alumni flat. This in turn was followed by half of the alumni cup flat phase. Then the process repeated with Section B of each of the above. Eighteen riders took part in the alumni cup class, which involved an over fences phase, a flat phase and a work-off phase. From left to right are lucky callbacks Caitlin Doran, Sara Palmer, Aidan Mewha and Jordan Rooney prior to the work-off phase. Three riders were called back from each of the flat advanced heats, including Malone. Also in this division were two of the original members of the High Point University equestrian team (which was founded earlier this decade). Both Rachael Lallier (who now rides in Zone 3, Region 5) and Julianne Kime (who continues to ride in Zone 5, Region 4 where High Point is located) managed to make the top six. Judge Babick had everyone walk, trot and canter in each direction, and eventually it was time for the first flat placings. Lallier, whose mother Bree Quinn coaches the Burlington County College team in Zone 3, Region 5 was third. Sara Palmer, who coaches both Villanova University and Valley Forge Military College in Zone 3, Region 5 but who is a graduate of the University of Delaware, was second (on the subject of coaches, Ashton Phillips, who coaches both Princeton University and New York University, but himself graduated from Virginia Intermont College, was fourth). Kime won the class, giving High Point alums two of the top three placings. The traditional Alumni Flat callbacks (again a total of six riders emerging from heats of eight or nine riders) were next to compete. This particular group of six included two riders from Rutgers University and two from Virginia Tech. Kristen Marley went on to place sixth for the Hokies while Katie Gehrt was fourth. Lehigh University graduate Maggie Gordon placed between the two VT grads with a fifth. Sonia Knutsen, a 2006 Fairfield University graduate now riding in Zone 3, Region 3 was third. This meant the two Scarlet Knights placed one - two in the division. Emily Hulak was reserve champion while Caitlin Doran was the winner. This marked the first time in three years of the tournament that the top two in any class came from the same college or university. It also marked the third time today that a rider who showed alumni in Zone 3, Region 4 during the 2013-14 season won a class at the '14 tournament. It is worth noting that at least 12 riders who showed in Zone 3, Region 4 took part in the alumni event this season. From left to right are Emily Hulak, Allison Schaitman, Aidan Mewha, Sara Palmer (or Sara McCoy Palmer as listed in the program), Caitlin Doran, Jordan Rooney, Katie LaDow and Kristen Marley, who made up the top eight in the alumni cup division. Both Palmer and Doran could claim a first and a second place ribbon during the proceedings, with Palmer this years' Alumni Cup Champion. The three-phased alumni cup was all that remained, with four of 18 riders asked to return for the work-off phase (four others were told to remain on standy for the awards presentation, as unlike the other four classes which were pinned to sixth place the alumni cup was pinned to eighth). Riders were asked to perform a specific test while each of the other three were to face the opposite direction. It was later learned that each of the four had apparently halted at one point in the test when no such halt was in the original instructions! Regardless the placings from eighth back to first were announced. Marley was eighth while Hulak was seventh, LaDow sixth and Allison Schaitman of Mount Ida College (who only two weeks earlier won the alumni flat class at IHSA Nationals) fifth. The top four were former Lynchburg College open rider Jordan Rooney in fourth, Mewha in third, Doran in second and Palmer champion. Though she has been married for at least four full seasons now Palmer was still listed in the program as Sara McCoy Palmer. Palmer, who showed in Zone 3, Region 5, became the first person not from a school located in the state of Connecticut to win the alumni cup (which resembles a champagne bucket). Palmer, who rode in at least one alumni class at 2006 IHSA Nationals, hinted that this might be the way to go out. However it should be noted that after reaching '06 Nationals Palmer tried retirement from the alumni divisions and eventually came back. The final results were announced at twenty minutes to three, bringing the 2014 Alumni Tournament of Champions to a conclusion. However there is one more similar alumni event on the calendar. The first - ever Western Alumni Tournament of Champions is planned for Saturday, July 18th at Red Wing Farm in Hilltown, Pennsylvania (a Philadelphia suburb), so the 2013-14 season won't truly be over until then, unless that show counts as the start of the 2014-15 season. Show Incidentals: Overcast skies with temperatures reaching the upper 60's. Entire show held indoors. Start time: 9:13AM. Finish: 2:40PM - includes 50 minute lunch/schooling break. There was a pre-show meeting of all riders and the organizers. Judge: Mary Babick. 2'3" Fences: 1. Michelle Geise, University of Scranton. 2. Meaghan Hennessy, Post University. 3. Rebecca Del Pizzo, Arcadia University. 4. Katie Gehrt, Virginia Tech. 5. Amy Melick, Montclair State University. 6. Sarah Bendyna, Burlington County College (NJ). 2'6" Fences. 1. Tim Malone, Dartmouth College. 2. Shirley Murphy, University of Massachusetts at Dartmouth. 3. Tracey Lightner, Delaware Valley College. 4. Emily Mallory, Lafayette College. 5. Kristi Jacobson, Lebanon Valley College. 6. Stacy Klein, Dartmouth College. Alumni Flat Advanced: 1. Julianne Kime, High Point University. 2. Sara McCoy Palmer, University of Delaware. 3. Rachael Lallier, High Point University. 4. Ashton Phillips, Virginia Intermont College. 5. Tim Malone, Dartmouth College. 6. Eryn Ziegler, Cedar Crest College. Alumni Flat: 1. Caitlin Doran, Rutgers University. 2 Emily Hulak, Rutgers University. 3. Sonia Knutsen, Fairfield University. 4. Katie Gehrt, Virginia Tech. 5. Maggie Gordon, Lehigh University. 6. Kristen Marley, Virginia Tech. Alumni Cup: 1. Sara McCoy Palmer, University of Delaware. 2. Caitlin Doran, Rutgers University. 3. Aidan Mewha, Westminster College. 4. Jordan Rooney, Lynchburg College. 5. Allison Schaitman, Mount Ida College. 6. Katie LaDow, University of Delaware. 7. Emily Hulak, Rutgers University. 8. Kristen Marley, Virginia Tech.